Shakespeare’s joyous comedy about confused lovers, magical intervention and a donkey was set in a sophisticated world ideally suited to being shaken up. 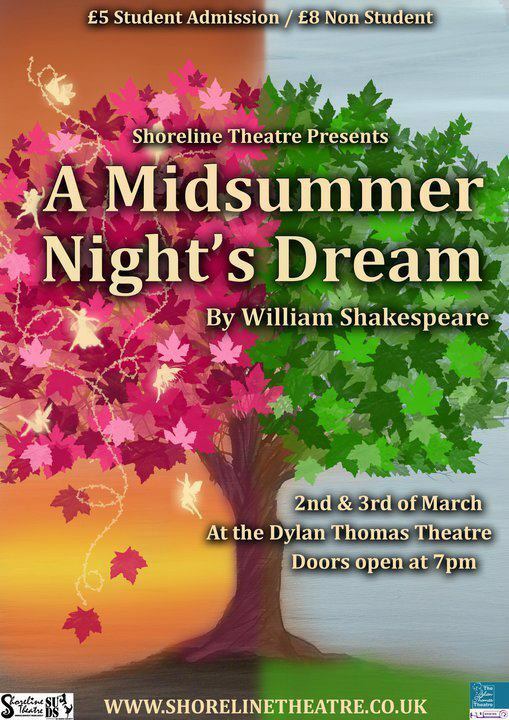 Written by William Shakespeare, A Midsummer Night’s Dream tells the tale of four lovers whose romantic intentions are manipulated by the magic of the King of the Fairies and his underling Puck. The play mixes romantic notions with comedy. It was directed by Nina Hansson and Roselle Bridge and was performed on the 2nd and 3rd of March 2011 at the Dylan Thomas Theatre. The show featured a collaboration with the Dance Society and the show was choreographed by Gemma Clegg. Nominated for ‘Best Event’ in the 2011 SU Awards. The dance scenes were choreographed by Gemma Clegg. Dancers were Tegan Rochfort, Jeny Nevard, Brydie O’Sullivan, Jojo Lee and Yvonne Tsui.